We’re almost ready to open next Wednesday! 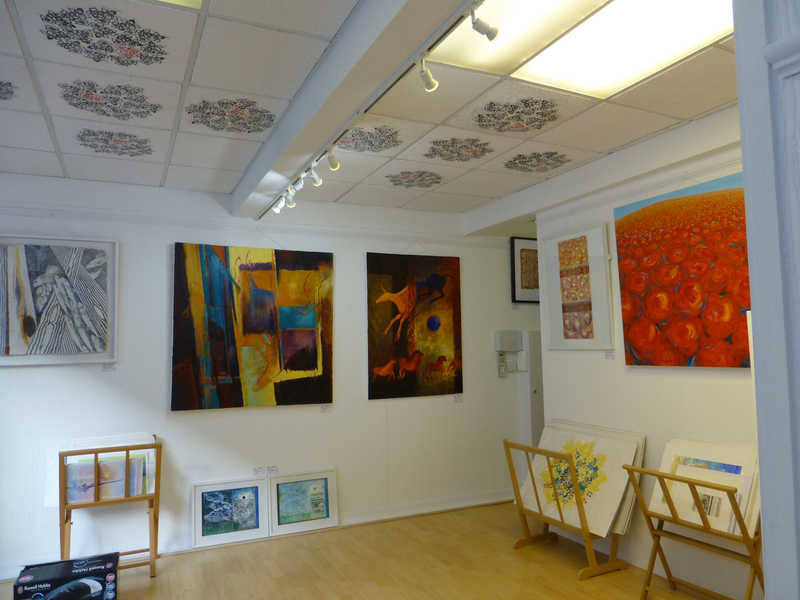 We’ve had a hectic time getting the building work done and hanging our work in the new studio/gallery. Here’s a view of part of the downstairs space – note the blossom prints on the ceiling. These prints were almost a disaster! Viv made them to cover big round holes that had been left in a lot of the ceiling tiles when we took out the old lighting to install spot lights on tracks. The prints are handprinted on canvas and we stuck them onto the tiles with carpet tape, which seemed to work well. Paul clambered around getting tiles up and down and we got in quite a mess taping the prints on, because the ink hadn’t dried properly. When we came back in, several days later, several prints were lying on the floor and others were hanging from the ceiling, looking like Salvador Dali floppy clocks! Lucky this didn’t happen when people were in the gallery – they might have been accidentally ‘printed’. Should all be safe now – very strong glue replacing the tape and most of the ink is dry! We’re open from Wednesday 19th – do come and see our work! Previous PostOur new Studio/GalleryNext PostWhat a busy week!